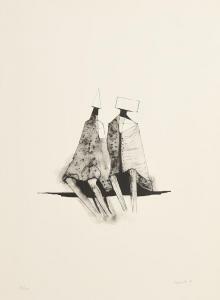 Find artworks, auction results, sale prices and pictures of Lynn Chadwick at auctions worldwide. 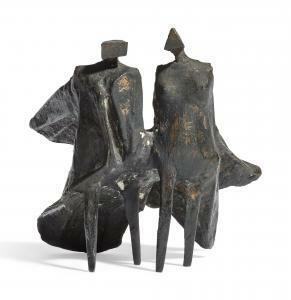 Lynn Chadwick, R.A. (1914-2003) Miniature Figure IV stamped with initial, numbered and dated 'C/776 78 11/30' (on the underside of the male figure's cloak) bronze with a black patina 3 in. (7 cm.) high Conceived and cast in 1978. Provenance with Court Gallery, Copenhagen, where purchased by the present owner's parents in August 1978, and by descent. 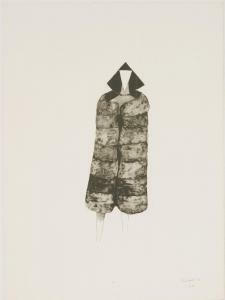 *Lynn Chadwick (British, 1914-2003) CLOAKED FIGURE Lithograph, 1971, signed, dated and inscribed 'E. d. A. ', an artist\’s proof aside from the edition of 200, printed by Erker Presse, St Galen, with their blind stamp, on BFK Rives paper, the full sheet sheet 76 x 56cm, framed *Artist's Resale Right may apply to this lot. SHINY DIAMOND II Lynn Chadwick, R.A. 1914-2003 signed, dated 70 and numbered 604 1/6; also stamped with foundry mark bronze height: 84cm. ; 33in. Conceived in 1970, the present work is number 1 from the edition of 6. Provenance Alwin Gallery, London, where acquired by the late ownerby the mid-1980s Exhibited Toronto, Gallery Moos, Lynn Chadwick, April - May 1972, illustrated (another cast). Literature Dennis Farr and Eva Chadwick, Lynn Chadwick Sculptor, With a Complete Illustrated Catalogue 1947-2003,Lund Humphries, Farnham, cat. no.604, illustrated p.276 (another cast). 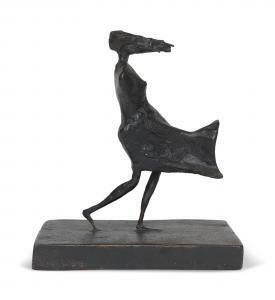 Lynn Chadwick (1914-2003) Maquette VIII High Wind stamped with the artist's monogram, inscription and number 'C C32 3/9' (on the base) bronze with black patina 6 7/8 x 4 1/8 x 5 7/8in. (17.6 x 10.5 x 15cm.) Executed in 1986, this work is number three from an edition of nine Provenance Berkeley Square Gallery, London. Acquired from the above by the present owner in 1989.